Spicy basil beef salad. 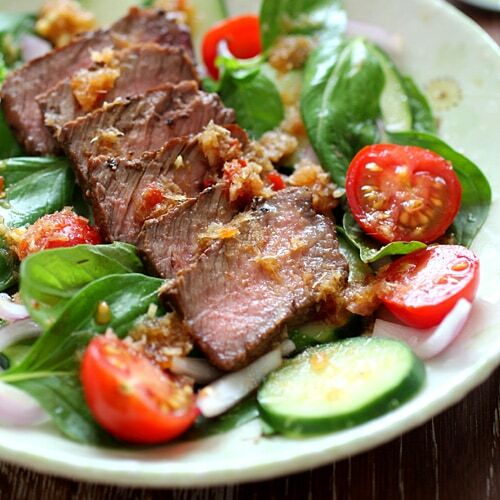 Perfectly seared beef with basil leaves, tomatoes and a spicy Thai dressing, so healthy and yummy! One of my favorite things to do is reading food and travel magazines. I usually go crazy when it’s summer as the newsstands are filled with all sorts of summer-themed magazines. Each with a mouthwatering cover and big bold text that pretty much screams “buy me and eat me.” Other than my regular magazine subscriptions, I usually succumb to these many temptations and stack up my collections. This year, my favorite summer magazines are Cooking Light and Martha Stewart’s Everyday Food. Each page lures me to try the recipes and this Spicy Basil Beef Salad recipe is just one of the many I have earmarked. I love the combination of three different types of basil, paired with perfectly pan-seared beef. There is no need to fire up the grill. The dressing is Asian, savory, spicy, with a tart note. The minced lemongrass adds an aromatic nuance and texture to the overall dish. It’s one refreshing, beautiful, and pleasant tasting salad, which I am sure many of you will like. Do you have a favorite summer salad recipe? Please share. Spicy basil beef salad. Perfectly seared beef with basil leaves, tomatoes and a spicy Thai dressing, so healthy and yummy. Heat a nonstick pan at medium-high heat. Season the steaks with the salt and black pepper. Add the steaks to the pan and cook until desired tenderness. Turning the steaks every few minutes will help it cook more evenly. Transfer the cooked steaks to a plate and let stand for 8-10 minutes before slicing. Combine the Salad's ingredients in a salad bowl. Drizzle 3/4 of the Dressing mixture over the salad and toss gently. Divide the salad into 4 servings and top each plate with sliced steaks. Drizzle the remaining dressing on the steaks. You can reduce the fresh basil leaves to 1/2 cup and add 1 cup of mixed spring green. Feel free to substitute the top sirloin steak with your choice of steak. Sambal oelek can be found at Asian grocery stores. Thanks Kalyn, you should try it. It’s a great recipe. My fav is Chinese chicken salad.So good i love the crispy wontons chips on top. You bet, it’s great, you should try it. I love this, I have been wanting to try out a steak salad lately and this looks just perfect! Julie – yes, it’s a great steak salad. This was the most delicious salad I ever had. I actually had it 2 days in arow . Would not mind having it again tomorrow. thank you so much. Was searching for beef recipes and stumbled on your website. Love this recipe! Thank You!